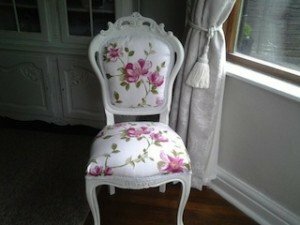 A hand painted white solid wood hall chair, upholstered to the seat and backrest in floral patterned fabric. 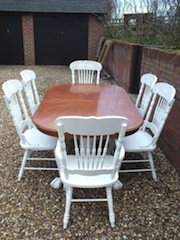 A vintage solid wood oval dining table on a hand painted white base, together with six matching high back dining chairs. 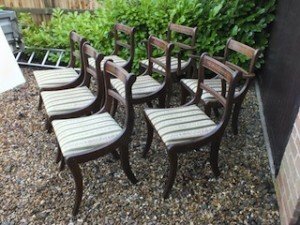 A set of eight solid wood vintage curved back dining chairs, upholstered to the seats in green floral and striped patterned fabric. 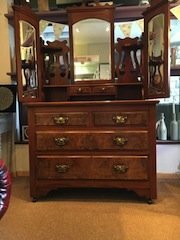 A solid wood vintage vanity dresser unit, having a tri folding mirror above two small over two large drawers. 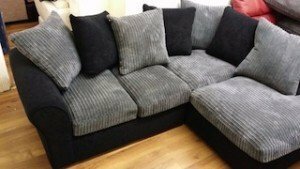 A four seater low back corner sofa, upholstered in black velour to the base and grey cord velour. 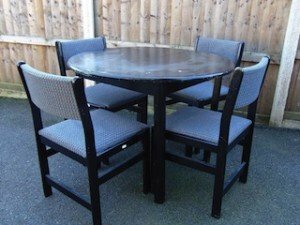 A black solid wood extendable circular dining table, together with four dining chairs, upholstered to the seat and backrest in patterned fabric. 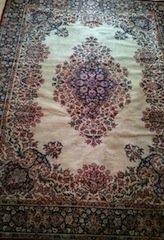 A large vintage Persian area rug, having a colourful floral pattern against a cream ground. 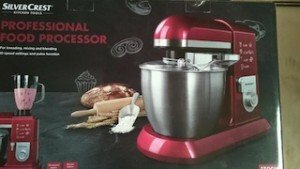 A brand new boxed SilverCrest metallic red and stainless steel professional food processor. 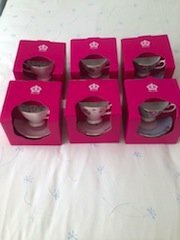 A collection of six brand new boxed floral patterned Royal Albert vintage style teacups and saucers. 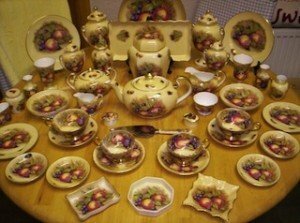 A large collection of fruit patterned vintage Aynsley bone China kitchen accessories, to include a pair of lidded urns, a ginger jar, milk jugs, teacups, saucers etc. 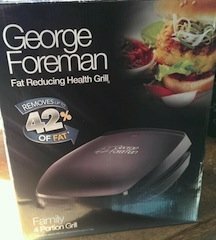 A brand new boxed black and stainless steel four portion George Foreman fat reducing health grill. 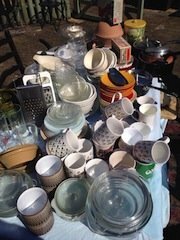 A collection of vintage kitchen accessories, to include a lidded casserole dish, a kitchen roll holder, teapots, tea, coffee and sugar canisters etc. 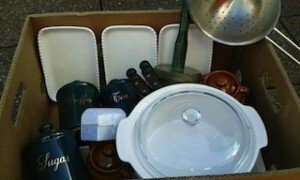 A large collection of kitchen accessories, to include coffee cups, two cheese graters, salad bowls, plates, saucepans etc. 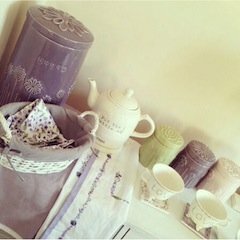 A collection of shabby chic style kitchen accessories, to include a lilac ceramic bread bin, a teapot, teacups etc. 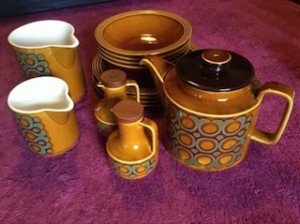 A collection of brown ceramic vintage kitchen accessories, to include a large teapot, two milk jugs, bowls etc. 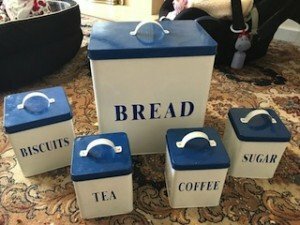 A collection of blue and white metal kitchen canisters, to include a large bread bin, a biscuit tin and tea, coffee and sugar canisters. 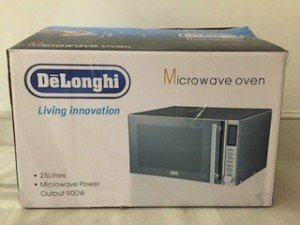 A brand new boxed stainless steel and glass 25 litre 900w DeLonghi microwave oven. 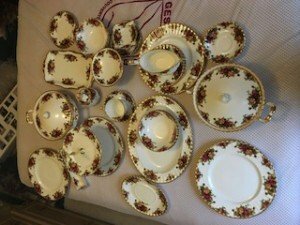 A collection of country rose patterned vintage crockery, to include a lidded casserole dish, a tray, a two tier cake stand, plates etc. 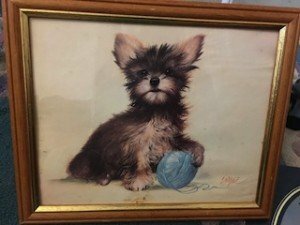 A vintage watercolour painting of a Yorkshire terrier with a bowl of blue wool, mounted in a gold painted solid wood frame. 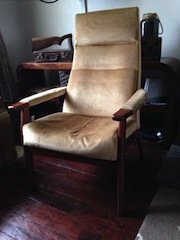 A vintage high back armchair on a mahogany base, upholstered to the seat and armrests in camel velour.